Antonia Canova, George Washington, 1818; Gesso (Possagno: Gypsotheca e Museo Antonio Canova). In 1816, the North Carolina Senate commissioned a full-length statue of George Washington to stand in the State House in Raleigh. Thomas Jefferson, believing that no American sculptor was up to the task, recommended Antonio Canova (1757–1822), then one of Europe’s most celebrated artists. 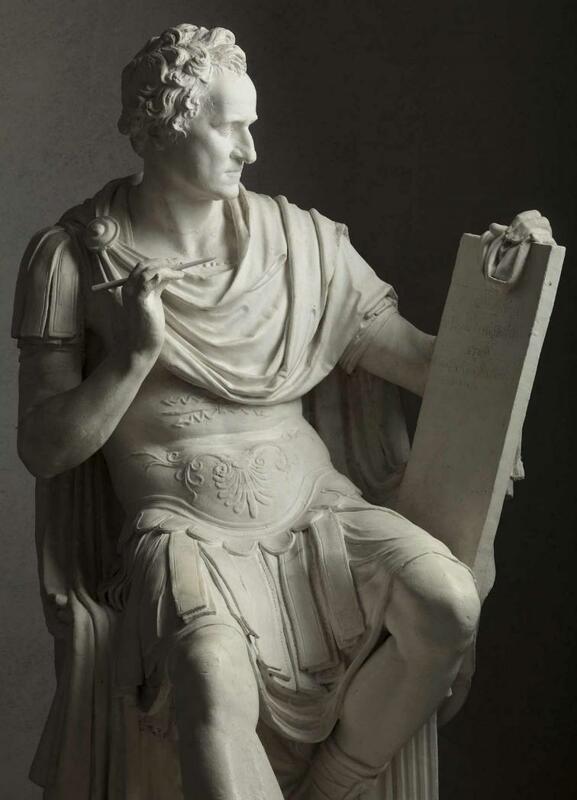 The first and only work Canova created for America, the statue depicted the nation’s first president in ancient Roman garb, per Jefferson’s urging, drafting his farewell address to the states. It was unveiled to great acclaim in 1821, and people traveled from far and wide to see it. Tragically, only a decade later, a fire swept through the State House, reducing the statue to just a few charred fragments. Canova’s George Washington examines the history of the artist’s lost masterpiece, probably the least well known of his public monuments. It brings together for the first time Canova’s full-sized preparatory plaster model (which has never left Italy), four preparatory sketches for the sculpture, and related engravings and drawings. The exhibition also includes Thomas Lawrence’s 1816 oil portrait of Canova, which, like the model and several sketches, will be on loan from the Gypsotheca e Museo Antonio Canova in Possagno, Italy, the birthplace of the artist. The exhibition is organized by Xavier F. Salomon, Peter Jay Sharp Chief Curator, in collaboration with Mario Guderzo, Director of the Gypsotheca e Museo Antonio Canova, the Venice International Foundation, and Friends of Venice Italy Inc. Following its presentation at the Frick, the exhibition will be shown in Italy at the Gypsotheca e Museo Antonio Canova in Possagno in the fall of 2018. The accompanying catalogue will include correspondence relating to the commission, as well as essays by Salomon, Guderzo, and Guido Beltramini, Director of the Palladio Museum in Vicenza, Italy.